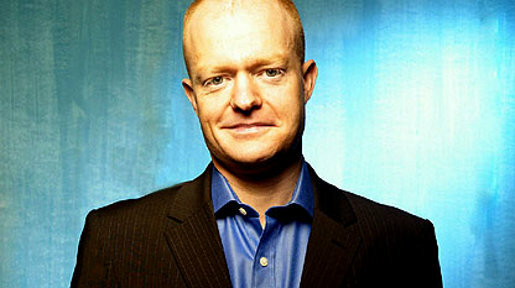 It’s been a while coming, but the news is now out that the new voice of Geico Gecko, in a hybrid Cockney London style, is Jake Wood, English comedian and actor. Read on for an exploration of the new Cockney accent, a background on Jake and a taste of the new commercials. Jake started his television work at the age of thirteen, with a role as Little John in medieval movie The Rose and the Sword (aka Flesh and Blood) in 1985. Last month, Jake started his new role as Max Branning in the English television series, EastEnders. In between he’s appeared as Jurka in The Illusionist (2006), Emil Maurice in Uncle Adolf (2005), Dresler in The Aryan Couple (2004), Detective Sergeant Pete Ainsworth in Lenny Blue TV series (2002), Tough Love TV Series (2000), Doug Wilson in The Wilsons (2000) and Kill Crazy in Red Dwarf (1999). A lot of people are writing to me asking, “What’s up with your accent?” Some people say I sound like an Aussie from “down under.” (After all, geckos are found all over the world.) Others say it sounds like an East End London, or Cockney, accent. Cockneys are considered working-class inhabitants of London. According to tradition, the strict definition is limited to those born within earshot of the bells of St. Mary-le-Bow, a historic church in the City of London. I think I’d agree that my voice does sound a bit like an East End London accent. Some of you write to ask why I have an accent. Others want to know why it is that accent. I dunno; I guess everybody has to sound like something. It would certainly be hard to get the word out about GEICO making the “clicking” sound many geckos make. Isn’t it enough that you know a talking gecko, especially one who can help you save on car insurance? Despite (or maybe because of) the controversy, I seem to be making a lasting impression. As for me, I’m not concerned with geography or nationality. I’ll just continue to “accent” the savings with GEICO! Now for the record, the Geico Gecko has been voiced by Kelsey Grammar (the stiff English accent), Richard Steven Horvitz (the voice in the Kung Fu Fighting spot), and Dave Kelly (the relaxed British-Aussie accent). Three of the eight commercials featuring Jake Wood’s voice are featured at Framestore New York, the company responsible for the visual effects. The spots were created at The Martin Agency, Richmond, Virginia, by Steve Bassett, Joe Lawson and Ken Hines, and produced by Kerry Berkbigler Ayers. Animations and filming was directed by Speck/Gordon, Furlined, with producer David Thorne. Lead CG Animator/Effects Supervisor at Framestore CFC was Dave Hulin, with producer Sarah Dowland. The three spots feature the Geico Gecko recruiting fellow small reptiles as sales reps for Geico Insurance. People who visit Geico.com could save hundreds on car insurance. Yeah? Which is big news. Yeah? But not if noone hears it. Which is why I need to help spread the word. Otherwise our big news is nothing but a stray little fact, a wee orphan of truth, wandering the streets looking for a home in someone’s ear. I knew it was here. ‘oy check this right. Three million drivers switched to Geico last year yeah? I’m telling you this, why? Because I want you to help spread the word. Bloke hears that number he’s quite impressed. He’s like “Three million! That’s a lot of people. Why wasn’t I invited?”. Then you’re like, “Of course you’re invited”. So he stops by Geico.com and he gets his free great quote. OK. Sure. It’s not a real party, it’s a web site but at least now the fellow’s done his homework. Look here’s the deal. When you talk about Geico.com you want to communicate three things. Easy to use. No middle man. Could save you hundreds on car insurance. Other than that just sort of be personable. Yeah the old “Nice weather i’n’t it? Cup of tea? That’s be lovely! How’s your mum? Cheers. (The lizard licks its eyeball). I’d stick with the small talk mate. Theatrics. Might come across as a bit cheesy. See my earlier post on Geico Gecko from October 2005. See also my June 2006 post on AdAge’s Geico Gecko Podcast.